If there is one chemical reaction providing the basis for our eukaryotic, multicellular life style, it is the oxyhydrogen reaction. Two very simple reactants, oxygen and hydrogen are reacting to form a similar simple and clean product, water, and a huge amount of energy. Oxyhydrogen is not only hazardous because of the energy involved; reactive oxygen species may form in the course of the reaction with deleterious consequences for biological molecules. Nevertheless, nature has managed to master this reaction; its potentially destructive energy satisfies the almost endless demands of our bodies. The oxyhydrogen reaction is tamed by huge assembly of protein complexes in the inner mitochondrial membrane, catalyzing the “respiratory chain”. Mitochondria have been derived from formerly independent bacteria and the recruitement of these organisms by the percursors of our cells is an interesting topic of its own. 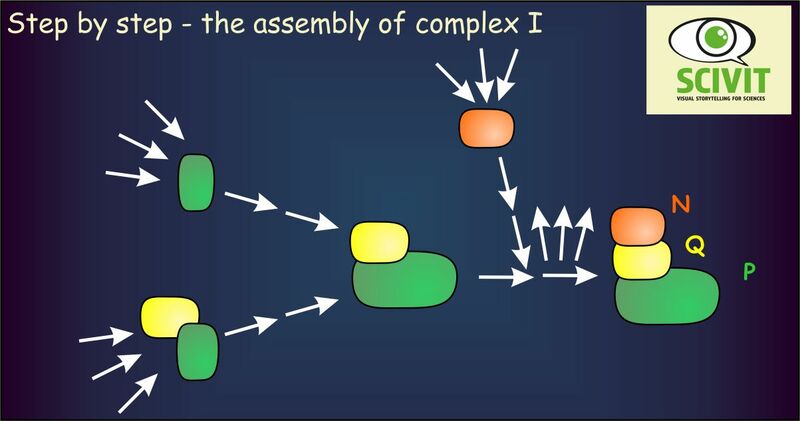 Here, however, we are talking about one of the protein complexes in the inner mitochondrial membrane, complex I. This complex catalyzes the first step of the respiratory chain. It accepts electrons from hydrogen (in the form of reduced nicotin-adenine-dinucleotide). Electrons are transferred to an electron shuttle within the mitochondrial membrane, ubiquinone. The energy referring to this transfer is transformed into an electrochemical membrane potential by the export of protons from mitochondria. Guerrero-Castillo and colleagues have studied, how this hydrophobic complex, consisting of 46 different proteins and several prosthetic groups, is assembled. This analysis was based on the fact that inhibition of mitochondrial protein production eliminates complex I from cultured human cells. Resumption of protein biosynthesis (following removal of the inhibitor chloramphenicol) results in reappearance of complex I and the authors followed this reappearance in detail. For analysis they used a gelelectrophoretic approach suitable for isolating respiratory chain protein complexes (Blue Native) combined with mass spectrometry. This way Guerrero-Castillo and colleagues identified several sub-complexes and their constituents on the way to forming a functional complex I.
Phylogenetic and functional analyses had shown that complex I is composed of three major modules. They are responsible for acceptance of electrons from NAD (N-module), transfer of electrons to ubiquinone (Q-module) and transportation of protons across the inner mitochondrial membrane (P-module). Results from Guerrero-Castillo and colleagues demonstrated that these modules are also crucial elements of assembly. After independent assembly they are combined with each other in a stepwise fashion to generate the final complex I. The analysis of Guerrero-Castillo and colleagues also allowed a close study of the role of assembly factors only attached to the complex during its assembly. Apart from providing a comprehensive picture about which factors helps assembling which module, the researchers identified three novel assembly factors. Finally researchers could demonstrate that complex I is integrated into the higher order respiratory chain complex only after complete assembly.